It's a problem for all crafters, but especially miniaturists who have so many tiny bits and pieces to keep track of. Keeping them organized and protected is essential. I'll be posting tips on managing your work space and supplies, it may just be a few here and there, but you'll be able to find them all in the sidebar Tags menu under "organizing." Eventually I hope they'll pile up into a useful resource for other miniaturists. 1. The dollar store is your friend! (When I say "dollar store," I mean any of those Dollar Store, Family Dollar, Dollar Tree, etc. - whichever one happens to be near you.) Plastic storage containers are waaay cheaper there than at office or craft supply stores. Check out the ones intended for food, too - a stack of little ones perfect for mini bits will only cost you a buck or two. Paper products, party supplies, seasonal stuff - a great source for all those things. 2. Along the same lines, check the dollar store or Wally World before you buy that cool drawer organizer cart at the office supply store - you're likely to find it for half the price. In fact, just don't buy anything at the office supply stores unless they're having a sale, it's all expensive! 3. Think of alternatives to expensive storage solutions. 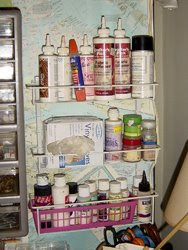 For example, you'll find lots of cool organizers for paints and materials at the craft store, but a $3 'spice rack' from Wally World will work just as well for a fraction of the cost. In the one pictured here, I've got my supplies sorted into glues & adhesives on top, odds & ends in the middle (rubber gloves, brush cleaner, paint thinner, and... poppy seeds and celery seeds) and paints & varnishes that I use all the time within easy reach on the bottom tier. For less than a dollar (often way less) you can pick up votive candle holders to hold your tools. 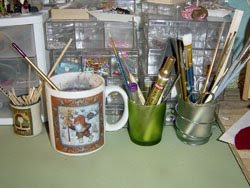 I use old mugs, too, once the handle breaks off and it gets demoted to pencil-holder or brush-rinsing duty, but many of the tools for mini projects are so tiny they get lost in a big ole mug. Plus I hate digging through a drawer trying to find that one tiny file or screwdriver that always goes missing just when you need it (and getting stabbed in the hand by some other small tool while you're at it.) Candle holders are the perfect height for holding tiny files, toothpicks and wood bits, small scissors, etc., organized and within easy reach. If you have any tips, post them in the comments and I'll add them to future blogs. great website Grace...and your miniature books are beautiful"
Love this section on organizing minis! Love your blog site Grace and your website as well. A lot of great information and valuable resources. Thanks for spreading the word about minis.